PINELLAS COUNTY, Fla. — A non-profit organization in Pinellas County helps students dress for success. Clothes to Kids is a clothing store that provides children on free or reduced lunch (or with a recent letter of referral) a weeks worth of clothing for free. Eligible students may set up appointments to receive clothing twice a year. When students come to the store, they have a true shopping experience. They get to pick out five new pairs of underwear and socks, four bottoms, five tops, a pair of shoes, a dress (optional), and jacket (seasonal). Kathy Burress is a long-time teacher turned Clothes to Kids volunteer. She says not having proper clothing can be detrimental to a child's experience at school. "I had a child with what he called 'talking shoes.' The soles flapped and the kids made fun of them. When that happens, their self-esteem goes down and they can't think about learning and feel good about themselves," explains Burress. In 2017, the organization gave out more than 10,000 wardrobes to Pinellas County students in need. If you are able to donate, below is a list of items the organization could always use. Also, a $50 donation will provide a child in need with a weeks worth of clothing. 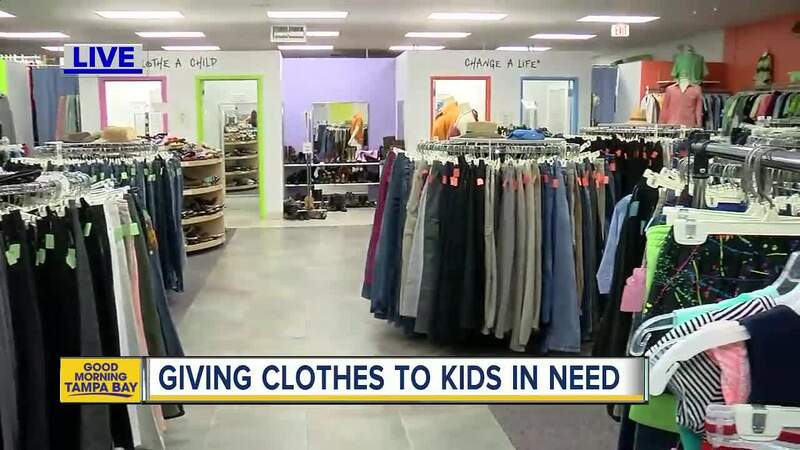 Currently, there are two Clothes to Kids stores, one in St. Pete and one in Clearwater. The organization is in the process of opening up a store in Tampa to help children in Hillsborough County. The Tampa location should be open in July.